In case you haven’t heard, at least part of the pilot episode of TURN will take place in 1776, according to multiple sources (including the online comic book discussed below). Does that mean we could see an appearance from Nathan Hale, the most famous spy of the American Revolution? Historically, his mission significantly influenced both Benjamin Tallmadge and the overall attitude of the Continental Army toward espionage. He’s already shown up in some of the TURN promotional online content. One of TURN’s executive producers is apparently a huge Nathan Hale fan. Nathan Hale was executed in September of 1776, nearly two years before Benjamin Tallmadge started forming the Culper Ring in the summer of 1778. Had he been alive, however, there’s a fairly good chance he could have been a part of it. Nathan Hale and Benjamin Tallmadge were both part of Yale College’s class of 1773, and their friendship remained strong even after parting ways after graduation. One of the central (and historically well-informed) arguments that TURN makes is that the success of the Culper Ring laid in part with the strong bonds of friendship its members forged when they were younger. Nathan Hale, one of Benjamin Tallmadge’s closest and most trusted friends from college, would have fit right in. Samples of correspondence between Nathan Hale and Benjamin Tallmadge. The original letters can be found at the Beinecke Rare Book and Manuscript Library at Yale University. The “voiceover” in this vignette is Benjamin Tallmadge, explaining to Caleb Brewster why the need for a secret spy ring is so important. 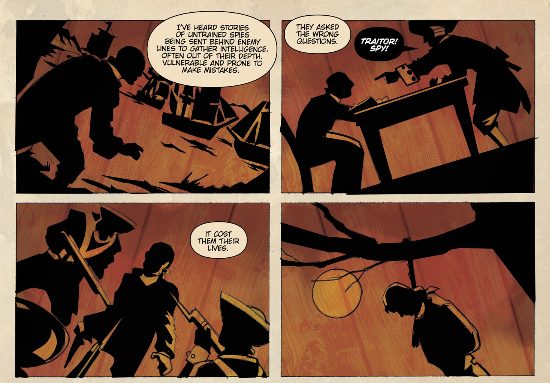 Nathan Hale isn’t mentioned by name, but for those who are familiar with his story and his connection to Tallmadge, there’s no doubt he’s the “untrained spy” in these four panels. This is actually my favorite part of the comic, both because of how well the silhouetted style conveys the sense of a “dark” flashback, and how it so neatly sums up the important lessons Hale’s contemporaries learned from his sacrifice. At the time, the story of Nathan Hale was a tragic and cautionary tale: when one of the brightest and most promising young officers in the Continental Army was hurriedly sent behind enemy lines without any training or support, both the mission and the man suffered a disastrous fate. Several historians (myself included) have argued that Hale’s death played a major role in both Benjamin Tallmadge’s decision to participate in intelligence gathering and how he went about creating and managing the Culper Spy Ring. 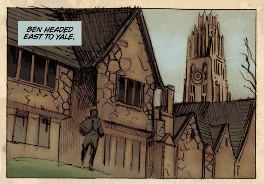 We already see that through Tallmadge referencing Hale’s story in the online comic – it’s only reasonable to expect at least as much in the TV premiere. Barry Josephson, one of “Turn’s” executive producers, says he was itching for years to do a movie about Nathan Hale, the Continental Army soldier who was caught spying and executed by the British, barely two months after the signing of the Declaration of Independence. Instead, Josephson said he found himself absorbed by [the story of the Culper Spy Ring]. 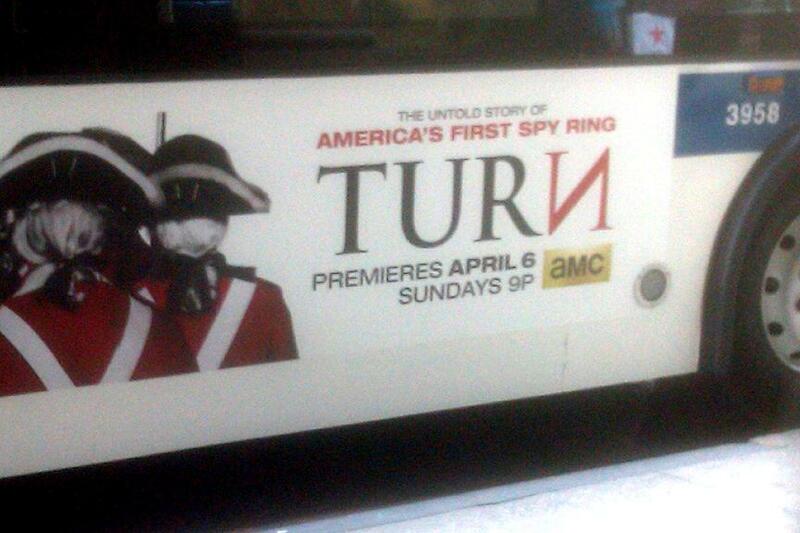 So, between Nathan Hale’s historical relevance to the Culper Ring, his appearance in the TURN: Origins comic, the fact that one of the Executive Producers is a huge fan, AND that part (if not all) of the pilot episode will take place in 1776, odds are good that we’ll see the famous ‘Martyr Spy’ make some kind of appearance on screen — though how big or small an appearance is anyone’s guess. So speaking of guesses, anyone else care to venture forth any thoughts or theories on a possible Nathan Hale cameo? (I know you’re out there, fanboys and fangirls. It’s okay! The Executive Producer is one of us!) What are your expectations for an on-screen Nathan Hale? Only three more days until we ALL find out what happens. 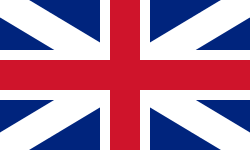 This entry was posted in Uncategorized and tagged benjamin tallmadge, culper spy ring, Nathan Hale, speculation, TURN, TURN origins, washington's spies, Yale Class of 1773. My own experience was corroborated by two other perceptive Connecticut agents friends of mine who had visited New York City in recent weeks. Nisreen spied another TURN bus, while Steve surreptitiously snapped a photo of an ad in a subway station. 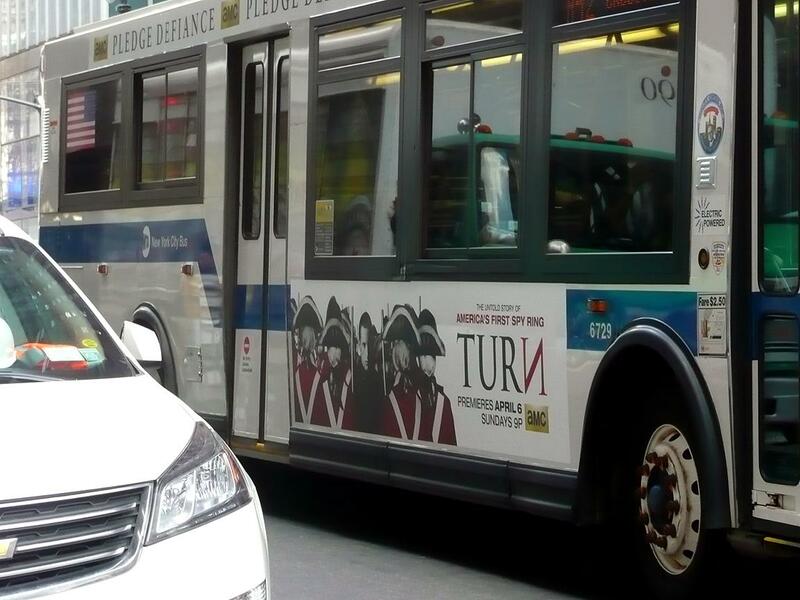 Over the course of the day, I saw many more ads for TURN on buses and taxis throughout the city — in fact, the only other TV show that seemed to be promoted more heavily than TURN in print advertising was HBO’s Game of Thrones. Pretty fitting, since one of the show’s primary settings will likely be 18th century New York City, although you’d never know it from the ad itself. 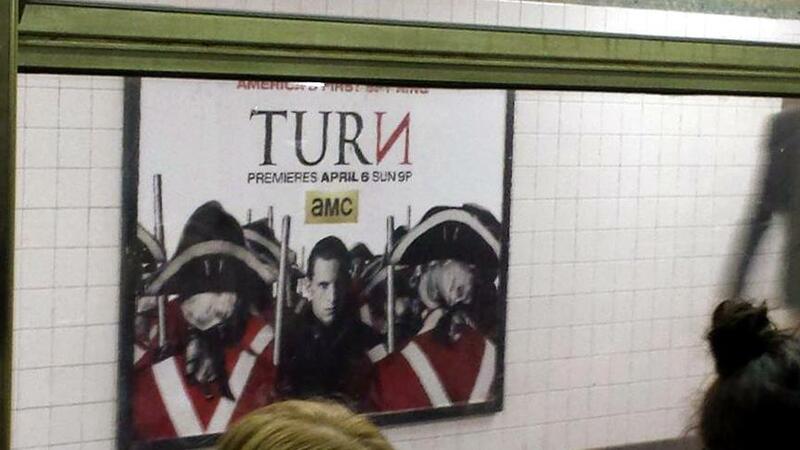 If anyone else has spotted ads for TURN in their corner of the country, please share! So far, this particular ad campaign guarantees that TURN is on the radar of literally millions of people in the New York City metro area. Whether they’ll actually tune in for the April 6th premiere, however, remains to be seen. This entry was posted in Uncategorized and tagged Abraham Woodhull, New York City, TURN, TURN ads. Where to TURN to first? Whether you’re a fan of early American history, epic television dramas, or both, I’m glad you’ve stumbled upon this humble historian’s dusty corner of the internet. I hope you’ll stick around and join the conversation here as AMC’s new show about the Revolutionary War unfolds over the next few months! 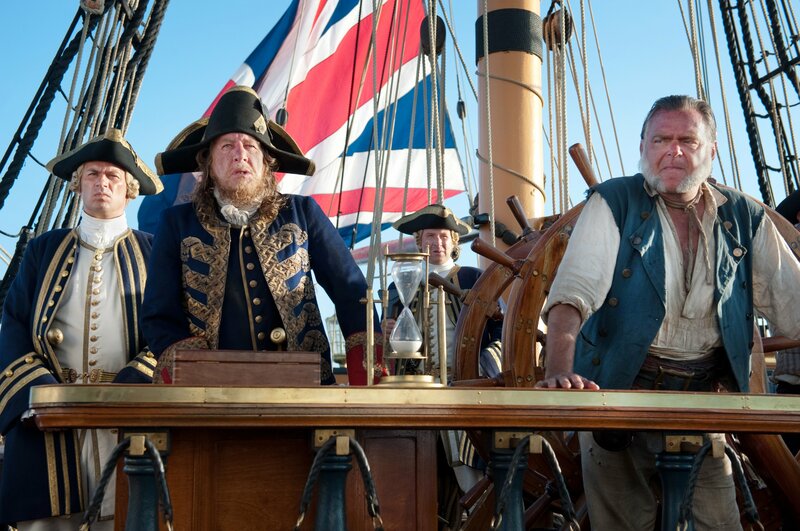 Even though the premiere of TURN is still over a week away, there’s already plenty to talk about. The TURN team at AMC has been busy these past few weeks, releasing trailers, cast and set photos, behind-the-scenes featurettes, and even an online comic book! I encourage you to check out their entire horde of goodies on the official show website. As a historian of Early America with a special focus on the American Revolution, I find myself in a curious situation in these final days before TURN’s official debut. I know what should happen in the show; I’ve studied the history; I’ve written and spoken about it at museums and academic conferences across the US. But since TURN is an artistic dramatization of historical events and not a documentary, it’s anyone guess (including mine!) as to how faithfully the “real story” of the Culper Spy Ring will ultimately be represented in the show. Unlike other blogs and press websites, this one has no connection with AMC whatsoever — no “courtesy” screenings or advance access to scripts, episode synopses, or other privileged information. “TURN to a historian” a completely independent, third-party site, and so you’ll find historical analysis here that you won’t get in officially sanctioned press releases or pre-approved blog reviews. After each episode airs, I’ll be able to help make the line between historical fact and Hollywood fiction clearer without feeling obligated to tone things down or pull any punches. I hope you’ll have as much fun reading this blog as I know I’ll have writing it. There’s an infinite number of directions that Hollywood can (and often does) take with factual history, and since AMC is hoping that TURN will be its next big hit, I wouldn’t be surprised to see them crank the drama up to 11 whenever they have the chance. Stay tuned! For the past couple of weeks, as this blog has slowly taken shape on the internet, I’ve been wondering where to begin, since there are no episodes of TURN publicly available yet. Earlier this week, AMC unveiled a new online graphic novel claiming to illustrate the origins of the Culper Spy Ring, and it looks to be a prime target of discussion. While I’m busy gathering down my own analytic take on it, you can read the comic for yourself here. And what an interesting comic it is! So check back soon for more updates — and don’t forget to TURN in for the show premiere on April 6th! This entry was posted in Uncategorized and tagged america's first spy ring, culper spy ring, mary woodhull, TURN, washington's spies.